"Some people think that red lipstick won't look good on darker skin tones, but red is meant to be noticed. On warm skin like Beyonce's, adding a cooler tone of lipstick makes the color jump off your skin. She went for a creamy texture. They're much friendlier than matte textures," said Goodwin. 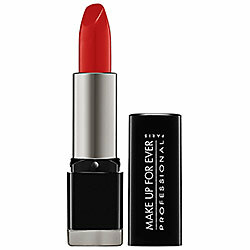 "The Make Up For Ever Rouge Artist Intense has an incredible vibrancy and some of the most bold, pigmented shades. If you're playing up a look like Beyonce's, this is a great go-to."